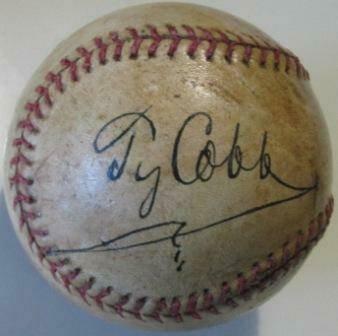 This alleged Ty Cobb single signed ball was sold by Colossal Auctions in their last sale. A new auction house appears to have entered the fray and their wares have caught the eye of many seasoned collectors who are calling out most of their vintage and rare autographed materials as outright forgeries. Colossal Auctions of Fairview, Michigan, operates a website that fails to list the names of the principals of the business, but offers items allegedly signed by big names like Christy Mathewson, Babe Ruth, Ty Cobb, Cap Anson and Eddie Plank. The auction house is offering signed baseballs, letters, Christmas cards and cut signatures galore from Hall of Famers that would surely command big bucks if they were genuine. 1. 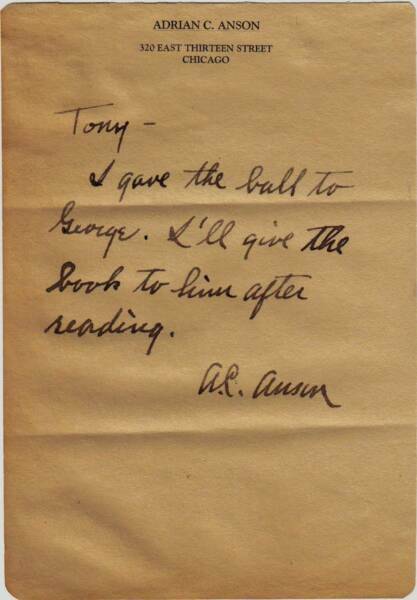 A letter alleged to have been written to August Herrmann by Christy Mathewson in 1916. Not only is this letter a forgery, it is a forgery of a letter, that if genuine, would have been stolen from the Baseball Hall of Fame’s famous August Herrmann Papers archive. 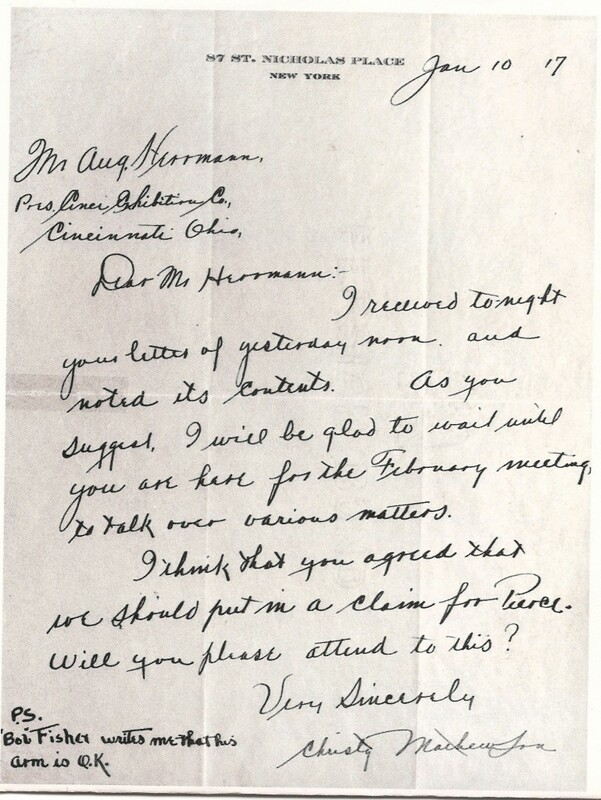 The HOF’s collection features all of the correspondence between Herrmann and Matty while he served as the Reds manager. Looks like this forger hit into a double-play. This forged Mathewson letter was being offered by Colossal Auctions. If it were genuine it would have been stolen from the Baseball Hall of Fame's Herrmann Papers collection. 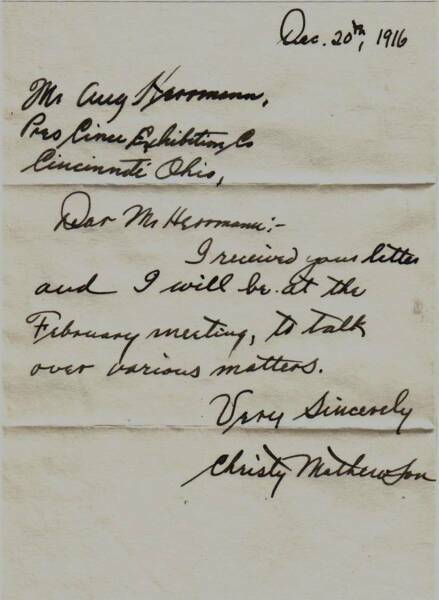 This is an authentic letter written by Christy Mathewson to August Herrmann that originates from the HOF's Herrmann archive. 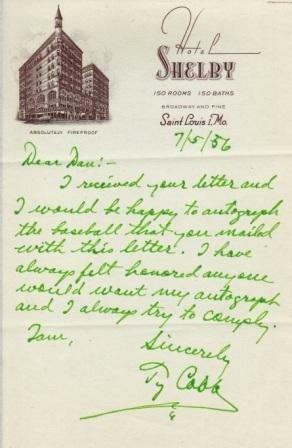 This alleged Cap Anson letter appeared on the Colossal Auctions website. 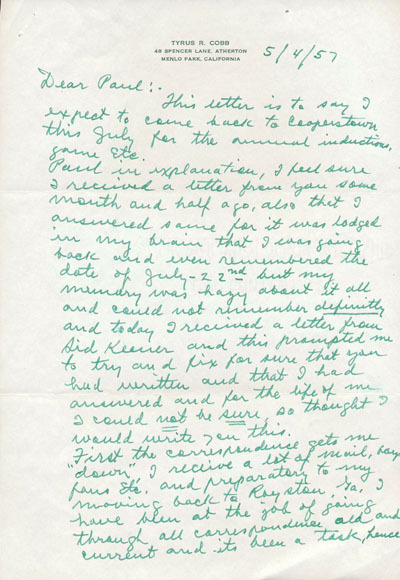 This authentic letter was executed in the hand of Adrian C. "Cap" Anson. This Cobb forgery also appears in the current Colossal Auctions sale. 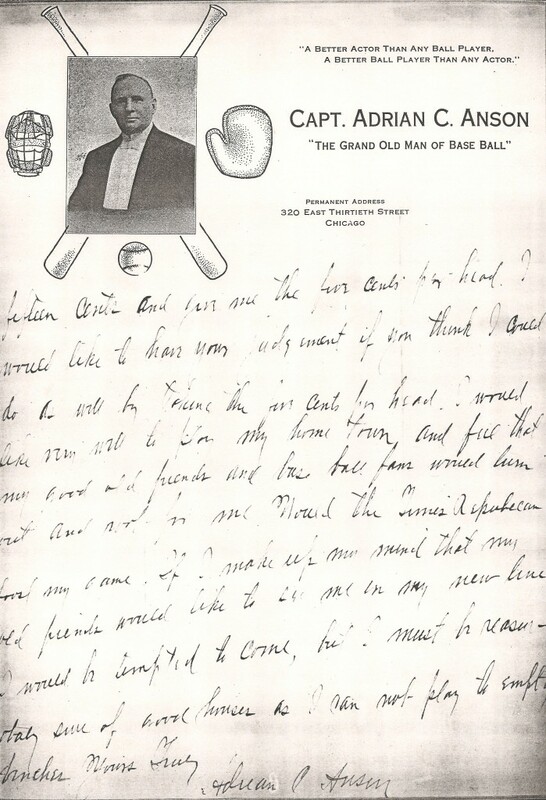 This authentic letter written by Ty Cobb to HOF President Paul Kerr is suspected to have been wrongfully removed from the National Baseball Library. While the major authentication companies would likely never certify these items and they would never make their way into one of the major auctions, Colossal does share at least one authentication with JSA and PSA. Like Hunt Auctions and others, Colossal is offering a copy of Christy Mathewson’s Won in the Ninth as bearing an authentic Matty signature although it is believed to have been ghost-signed by someone other than Mathewson. 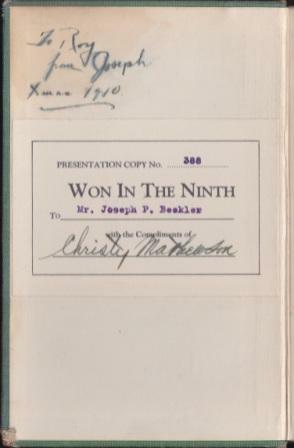 Colossal's auction also features a copy of Christy Mathewson's "Won in the Ninth" which is believed to have been ghost-signed. The auction items pictured in this article were shown on the Colossal website earlier this week but it appears that, while most all lots are still open for bids, the images of the items have been removed from the site. It also appears that the Mathewson and Anson letters have vanished from the site. The images of the items were saved from the Colossal website before they were removed. Looking over a past auction and seeing how low a lot of the items went for i a major sign of things. When is that crazy YouTube guy from NJ who made the Coach’s Corner videos gonna go off on this place? Can’t wait! The auction looks like it took down all of the photos for all of the auction lots?????? They do picture a Mathewson check though, and that looks like the letter. If Colossal has COA’s and stands by a money back guarantee if any COA is found to be invalid, then what’s the problem? Either the buyer gets what he paid for or he gets his money back if the piece isn’t genuine (or, if the price the buyer paid is really low, then he got what he paid for). Obviously, no one should sell stolen property, but if there is a dispute about what’s genuine, isn’t a COA and a money back guarantee enough to allow for such problems that may arise? So I can sell fakes as long as I refund people who complain? Krayt – good point, but that’s not what I’m saying. It seems to me that if you get items reasonably authenticated, you can sell them and let the buyer beware that the authentication may not be accurate. We all know that authenticators can’t guarantee authenticity. I fully agree that a sham authentication can’t permit someone to legitimately sell what they know or believe to be fakes, but I highly doubt that’s what Colossal is doing. Had to look at thier site. Peter, you have been called Shameful and even worse a blogger. I would laugh if it wasn’t so serious. Colossal also claims their customers have been blocked from leaving comments although none of their customers have left any comments. They have claimed to leave comments but actually sent emails to us on our “contacts” section. Comments/Questions My husband and I are from Michigan and are avid collectors. We attended the last 3 Colossal Auctions and previews. At no time was there ever a Mathewson or Anson letter offer for bid or in their catalog list in any of their auctions. There may have been some questionable items out of the 200, but nothing as blatant as Nash is suggesting. Someone at Haulsofshame.com was given the wrong information. Shame on the haulofshame. It seems that Nash is setting himself up for a lawsuit. I see, Joe, and certainly didn’t mean to come off as insulting or anything. I thought you meant it would be reasonable even if they used a clown like Morales. I’m braindead this week. So they are “educating” the collector about various COA’s on ebay yet they would probably choose a 3rd party authenticator who is on the ebay banned list. According to the website of Colossal Auctions, they have now changed their refund policy. sold, as unconditionally guaranteed genuine. Our money back guarantee on autographs entitles the winning bidder to receive a refund of the winning bid price. The item must be returned to us within 45 days from the date of purchase, along with a written statement submitted by a reputable independent 3rd party authenticator or forensic examiner, stating the reasons why they did not wish to render an opinion as to the authenticity of the submitted piece. This guarantee does not apply to non-autographed items.